Cartoons and animation movies are widely accepted as entertainment for children and the occasional peculiar adult. However, every once in a while an animated film is produced that is enjoyed by people of all ages. 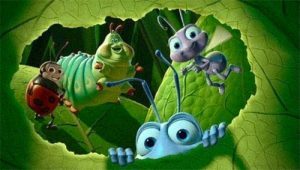 It is safe to say that A Bug’s Life was one such movie. This classic was produced way back in 1998 and the producers did a pretty good job considering the tech limitations of the late 20th century. Since we work with insects and bugs on a daily basis and only recently watched this again, we thought we’d do up a quick post about it. Below is our review of the movie that should help shed some light on why people loved it so much and why those who hated it did so passionately. This 95 minute product of a Pixar-Disney collaboration was inspired by the classical folktale ‘The Ant and the Grasshopper’ by Aesop. The writers added their own unique twist with a bucket load of humor to make it a more interesting and versatile production. The movie is set around a nasty feud between a group of hooligan grasshoppers and the hardworking colony of ants under their oppressive rule. The lead character, Flik, is a sweet but clueless little ant with big dreams of becoming an inventor and a whole lot of clumsy in his DNA. He accidentally lands his colony into trouble when his invention causes the loss of food that the colony owes the grasshoppers. In order to save his the ants from the wrath of their masters, the brave little ant sets out in search of fearless warriors to help him defend his colony. He recruits a bunch of warriors to his cause; only they aren’t really warriors but recently fired circus bugs. The two parties decide to lie to the colony about the bugs’ real identity in order to keep spirits up and to foster faith in the troupe against Hopper and his gang of bully grasshoppers. Needless to say, their secret is spilled by the troupe’s former employer P.T. Flea leading to Flik’s exile. Meanwhile, Hopper plots to kill the Queen prompting her youngest daughter Dot (whom Flik and the circus bugs had earlier saved) to reach out to Flik for help. Long story short, Flik leads the circus bugs and the rest of the ants in an inspiring and successful revolution against the grasshoppers that ends in Hoppers death at the beak of a bird. Atta, the colony’s princes, and Flik become an item; the circus bugs return to their life on the road and everyone pretty much lives happily ever after. We dare you not to cry when you watch the farewell scene. The storyline in this movie is pretty phenomenal. It is one of those movies that make you feel a large range of emotions from anger and sadness to inspiration and happiness. The several visual and verbal comic cues also make the movie humorous and are partially to thank for the age versatility. In addition to having a great storyline, the movie’s production and animation quality are really good. As you would expect from a collaboration of two of the best animation companies in the industry. In our opinion, and that of many other A Bug’s Life fans, the only bad thing about this movie is the fact that there wasn’t a sequel! In spite of being nearly flawless as far as entertainment value is concerned, this movie had its fair share of controversy. If you have watched Antz from DreamWorks Production then you have probably noticed the uncanny resemblance between these two movies in terms of everything from storyline to animation features. For a long time, the two production teams were, to put it lightly, at war about who stole whose idea. For this reason, diehard DreamWorks fans did not take to A Bug’s Life as well as the rest of the consumer market with most of the movie’s negative criticism being as a result of this controversy. After all is said and done, A Bug’s Life was, and still is, a great movie. Everything from the storyline to the production value justified the high ratings and the positive reception that the movie received. Although it is almost 20 years since the movie was released, there is no denying the fact that this movie that had us believing that bugs had a secret life and mind of their own will be in the list of great classics for a very long time. The team here at Pesky Possum highly recommend watching this film if you haven’t already. 4 and a half stars.